Hello! I hope you are having a beautiful day in your neck of the woods. We are finally experiencing some warmer weather where I live which makes me so happy on the inside. I love spring! 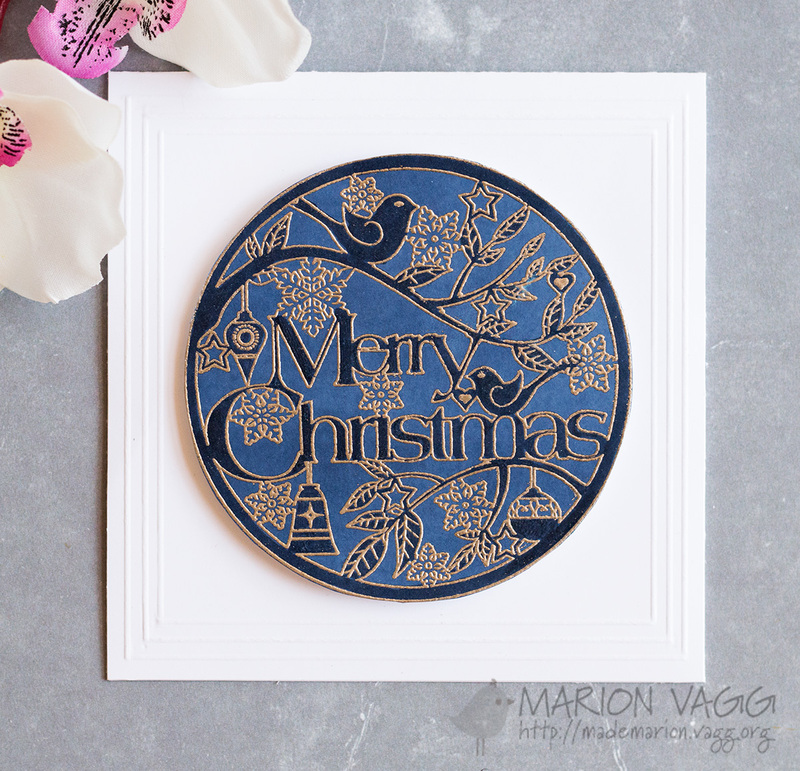 Anyway, I have been having a lot of fun with the Penny Black Christmas in the Round rubber stamp. This was released last Christmas and I have been meaning to play with it all year. I have also discovered Ranger’s Liquid Platinum embossing powder and I am in love with this stuff! It is a beautiful muted gold colour – perfect for Christmas in my opinion. I have made three cards the same, just used different colours, and then I finished off each border a little differently. I started with a white piece of card stock in each case, and coloured it with completely (and very heavily) with Distress Ink (Chipped Sapphire, Festive Berried and Peacock Feathers). I could have used coloured card stock, but realised that I didn’t have any navy card stock left, so I made my own! Once the card stock was completely dry – I left them overnight to make sure – I then used Versmark ink and stamped the Round For Christmas stamp the embossed it with the Platinum Gold embossing powder and heat set it. I used the matching Distress Marker colour and coloured in various elements of the ornament. I also covered these areas with a layer of shimmer using a clear Wink of Stella glitter brush pen. The scoring around the edge was done on a scoring board with a stylus. I changed it up on all three cards for a little bit of variety. I hope you enjoyed the Jane’s Doodles blog hop over the weekend. Jane’s newly released stamps are always amazing – if you haven’t seen it, head here. I am still in Christmas card making mode, and today is no exception. I love combining sets to create little scenes – as it is snow much fun! Ha. 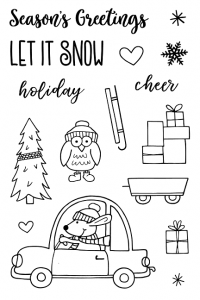 I used Winter Wishes, Winter Fun and the newly released Driving Home for Christmas set. I also busted out my Nuvo Jewel drops (I only own two of them) to add snow to the scene as well as using a white gel pen. I layered up three of the frames around the scene to add some dimension. Other Supplies: Copic Markers, Lawn Fawn Say Cheese die (It’s a polaroid die and I cut the bottom portion off to create a square frame), Cuttlebug, Ink Bending tool, Masking paper, Uniball white signo gel pen, Nuvo Jewel drops – Sea Breeze, Ink blending tool. I hope you are having a fabulous week. Hello! 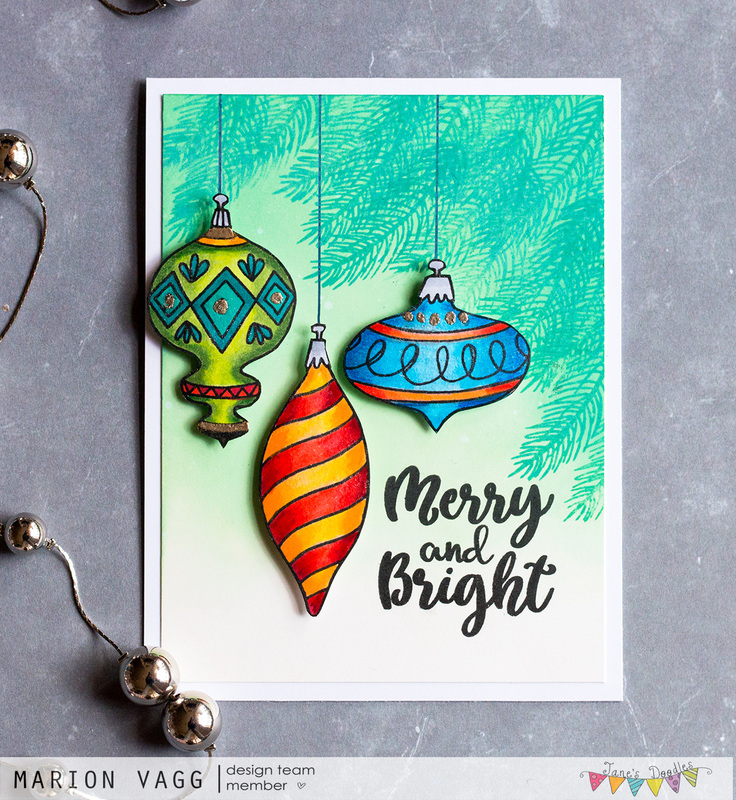 Welcome to the Jane’s Doodles blog hop where the Design team are showcasing Jane’s latest Christmas stamp release. You should have arrived from Ange’s blog. If you get lost along the way, there is a list of blog hop contributors at the end of this post. Jane’s latest release doesn’t disappoint at all. Check it out. For today I have made three cards, as I just couldn’t stop! First up I used the Deck the Halls stamp set. 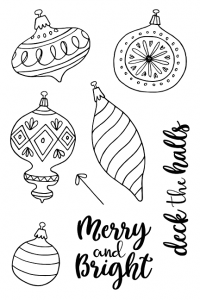 I stamped and coloured the Christmas baubles with Copic Markers and fussy cut them out. I foam mounted them onto my panel that I had blended with some Cracked Pistachio Distress Oxide ink. 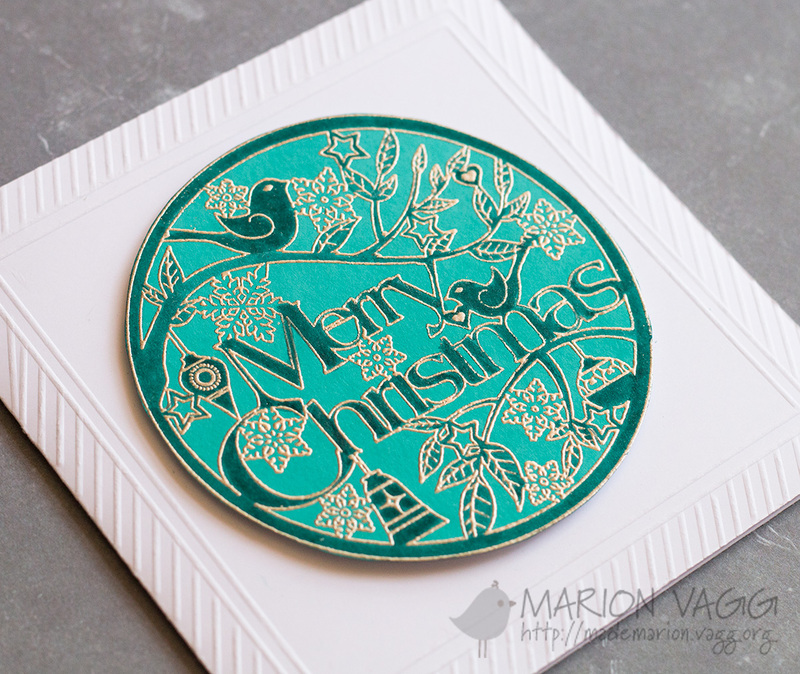 I also stamped a branch image from the Christmas Blessing stamp set with Lucky Clover Distress Oxide ink. 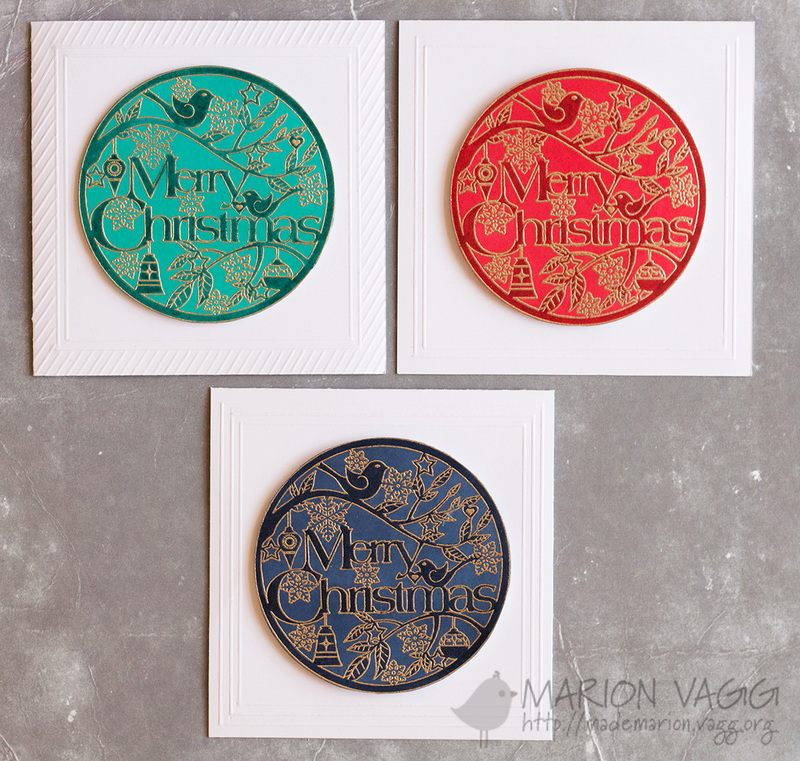 I added some gold embossing powder to some areas of the baubles with my Versamark pen and heat embossed it. 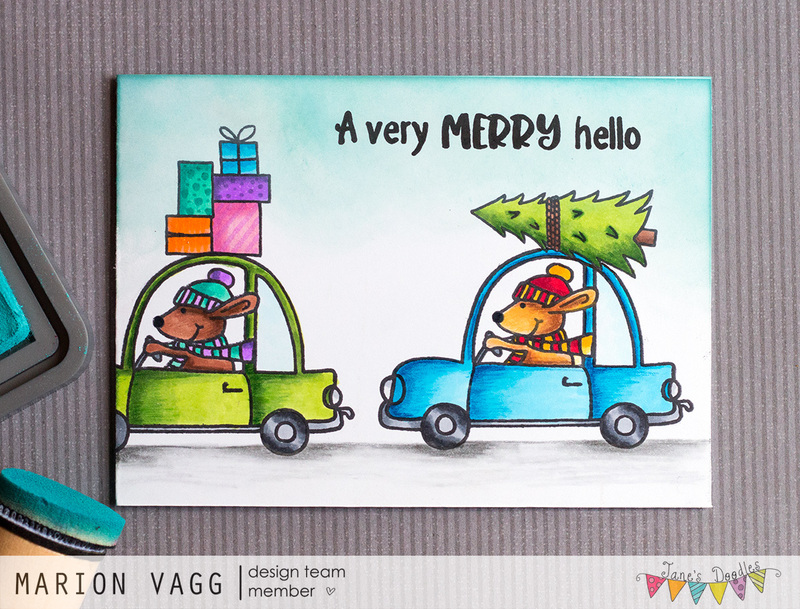 Next card uses the cute Driving Home for Christmas set. So adorable! I know I’ll be using this one again very soon. This is a simple one layer card, coloured with Copics and Prismacolor pencils. 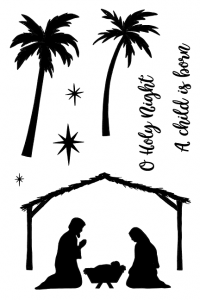 The sentiment is from the Merry Christmas stamp set. And last but not least I used the Holy Night stamp set. I blended in a range of Distress Oxide Inks to create a beautiful sunset scene. I splattered it with water to create the stars. Once dry, I stamped the images in VersaFine Onyx black ink. I silver heat embossed 3 stars from the set as well. In addition to Jane have a 20% off sale on all clear stamps, she is giving the 3 stamps released today to one lucky winner. All you need to do is comment on all the blogs in the hop and you’ll be in with a chance to win! Good luck! 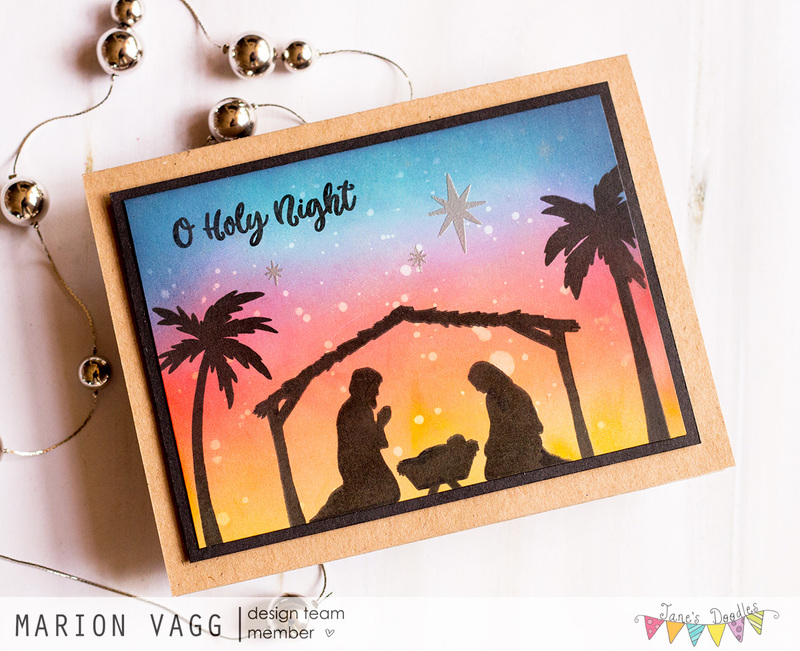 Your next stop on the hop is Kaja’s amazing blog and I know her cards will not disappoint you! Happy Tuesday! 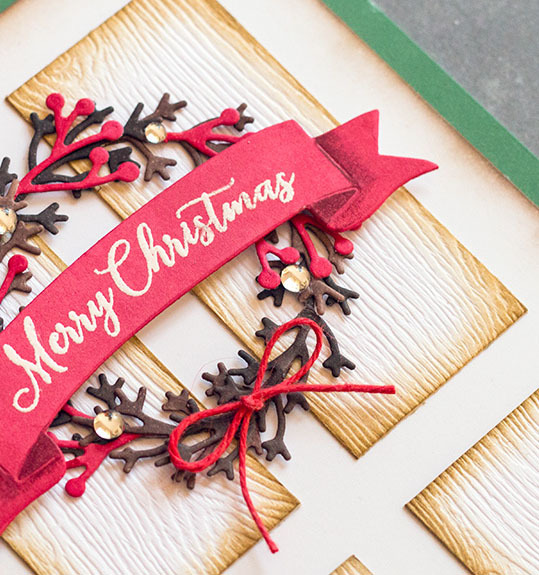 I have a card over on the Simplicity blog today. 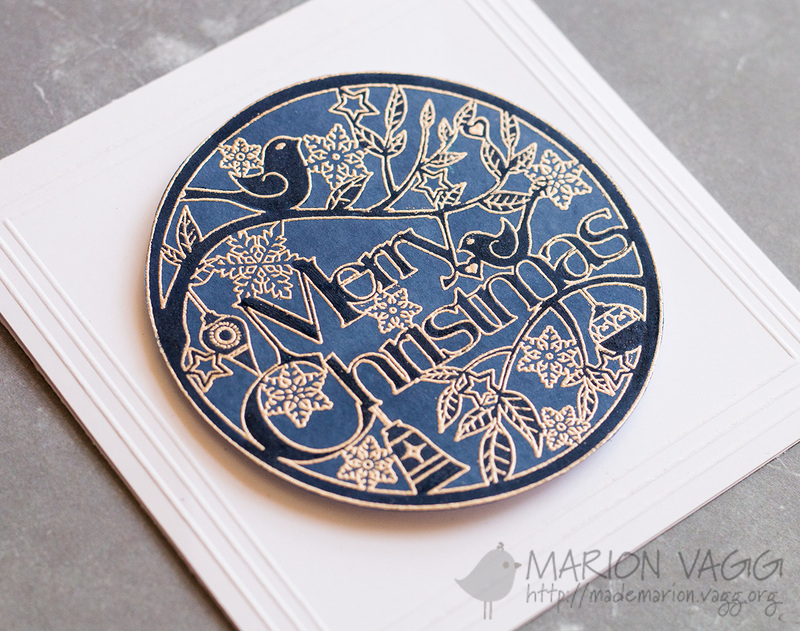 Another Christmas card using some awesome Penny Black dies. Here is a sneak peek for you. Head to the Simplicity blog for the full reveal.